Here’s the full story that Lisa Rochon wrote in the Globe and Mail about Vancouver’s need for more iconic architure. [I added my comments here.] It’s well worth a second read, just for some of the delicious details. Carbon dioxide is accumulating in the atmosphere much faster than scientists expected, raising fears that humankind may have less time to tackle climate change than previously thought.New figures from dozens of measuring stations across the world reveal that concentrations of CO2, the main greenhouse gas, rose at record levels during 2006 – the fourth year in the last five to show a sharp increase. Experts are puzzled because the spike, which follows decades of more modest annual rises, does not appear to match the pattern of steady increases in human emissions. The Runaway Effect, which was only mooted about – and often discounted – by credible sources a few years, now seems to be openly discussed. Read the whole article: Surge in carbon levels raises fears of runaway warming. The New York Times reports on the Vancouver dilemma: the Living First policy, which has encouraged more residential development downtown, is a victim of its own success. Or rather, the victim is the lack of commercial development to provide space for jobs and to loosen up the core-office vacancy rate, now at a very low 3.3 percent. This is not a new story – and the City has already responded with new policies – but coverage in the august New York Times makes it an even bigger issue. Over the last 15 years, downtown Vancouver has become a leader in North America’s urban housing renaissance. 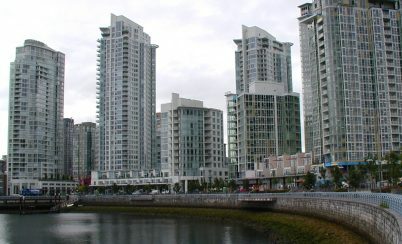 Under Vancouver’s “living first” policy, which was adopted 20 years ago, the downtown population has increased to 80,000 from 40,000, out of a total city population of 600,000. By 2030, planners expect 120,000 people to live in the city’s shimmering glass skyscrapers, which overlook the snowcapped North Shore mountains, English Bay and Coal Harbour…. Nevertheless, encouraging new office construction will not be an easy task, Mr. Toderian said. The Vancouver office market has a number of relatively small tenants, and he said there was a reluctance on the part of local developers to build office towers on speculation. And now the Bay Parkade project, which is a test case of the city’s new approach, has some developers suggesting that office growth is not viable…. According to the city’s jobs and land-use plan, downtown will need about 65 million square feet of space to accommodate job growth over the next 20 years. That is about 10 million more than the capacity under current land-use regulations. Class A office vacancy rates have already dropped to 3.3 percent, down from 12.3 percent two years ago, and recent transactions set a new high of 40 Canadian dollars ($34) a square foot, according to Jennifer Robertson of Cushman & Wakefield…. NYT Pipeline: Who Cares About the Price of Gas? I subscribe to the New York Times Select – the stuff you have to pay for to see on the web. It’s one strategy the dead-tree media are using to remain viable. In this case, it’s worth it. An overwhelming number of Americans believe that our oil problems can be solved by better auto technology …. Why? In 1977 the average family traveled 12, 036 miles a year, but by 2001, we were driving 21,171 miles to and from work, soccer practice and the mall. People bought bigger cars to make the longer drives more bearable, and now they’re stuck with both the cars and the commutes. Generations of Americans have come to expect a constant flow of cheap gasoline as a right — and they attribute high prices to oil company shenanigans. Eric Smith, a political scientist at the University of California at Santa Barbara, found that that 85 percent of Californians believe that high gas prices are the result of oil company manipulation, not market pressures. And if there’s no shortage, why conserve? To really address our overconsumption of oil, we need to fix the drivers along with the cars. And that will require big new approaches. For years, environmentalists have begged for higher gas taxes as a way to discourage people from wasting gas. But we have demonstrated that we can’t or won’t respond rationally to high prices, so taxes will not push conservation. We need to rethink our supply-based energy policy, and ready to start making changes both big and small in the way we consume oil. That’s a formula for catastrophe – the mechanism a deluded population requires before accepting change. Not exactly a great political platform or policy recommendation. Perhaps it explains why most politicians are not engaging the big issues, particularly climate change, or making the connections to our way of life. From a glance at the headlines in the newspaper boxes, the B.C. Place replacement story has legs. The best solution is to build up close to the existing stadium on all sides (though being careful not to prevent a future new roof on separate supports ringing the perimter of the dome. I understand that there was a plan to build a replacement for the defunct Robson Square Conference Centre adjacent to BC Place before the provincial government started to disband BC Buildings Corp., BC Pavillion Corp, or whatever it was called. 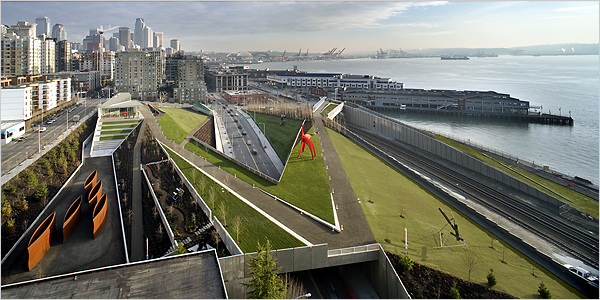 I predicted a few months ago that the new sculpture park on the Seattle waterfront may be the next best urban space on the west coast. Maybe. It’s due to open on January 20th – but the hype is underway. Here’s the latest from the New York Times, along with the picture above. Or this, in The Oregonian from Portland. And here’s Trevor Boddy’s review in the Seattle Times. Hopefully the success of the park will persuade people that rebuilding the Alaskan way Viaduct, just to the south, would be a very bad idea if it foreclosed other opportunities like this. Seattle is worthy of so much better. … as civic leaders emphasize the importance of urban density to save the splendor of the surrounding countryside, they also recognize the need for parks and civic spaces downtown. As the Alaskan Way Viaduct debate heats up, some are hoping a walk in the Olympic Sculpture Park will open people’s minds to new possibilities for downtown. Go out and get a copy of the Saturday, January 13th Globe and Mail. There’s a story in it that will make you feel good about being a Canadian – and give you some shread of hope for our beleagered planet. 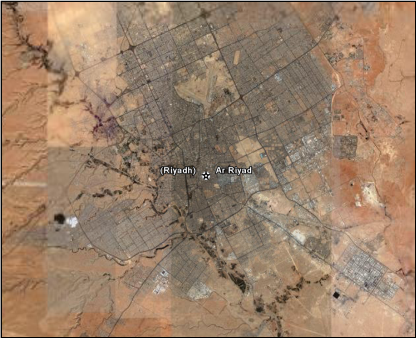 This is the story of the Wadi Hanifah, the river that runs through Riyadh, capital of Saudi Arabia. Though it made human settlement possible a thousand years ago, the river had become a dumpsite for everything from automobiles to animal carcasses. But six years ago, Saudi princes summoned the Canadians: Moriyama & Teshima – the Toronto architecture and environmental planning firm. The article details the work of George Stockton and Drew Wensley, and shows kilometre by kilometre what they’re doing to bring a river back from the dead. You can give yourself virtual vertigo by swooping around on Google Earth, the 3-D computer program that offers aerial views of almost every place on the planet. Especially if you zoom from, say, Toronto to the barren desert of Saudi Arabia and then zero in on the tangle of housing and highways that is Riyadh. The Wadi is the “intriguing dark line” running diagonally from the upper left. Maybe the fact that this is a Canadian-led project is why you’ve never heard of it before. If you like hip lefty, arty scene that dominates the SSM (Side Stream Media) in Vancouver, you’ll like the tone of Beyond Robson. The best reason to check it out, though, is its Morning Brew – a quick survey of the local media/blog scene, with links to items you’d otherwise never know about. Lisa Rochon hits the nail on its monotonous little head. Finally, after five years, I understand the paradox: how Vancouver can be progressive in livability but so maddeningly conservative in design. Rochon’s Globe and Mail piece – “Time to build outside the box” – critiques the architectural scene in Vancouver, now that previous planner Larry Beasley is off to Abu Dhabi. Over the past decade, Vancouver has developed a culture of urban rules rather than a culture of great design. There are rules for just about any move an architect might want to make…. “The Beasley regime was so formulaic,” charges James Cheng, another of Vancouver’s major architects who designed the 60-storey Shangri-La luxury hotel and residence currently under construction on West Georgia Street in the city’s downtown. Hmmm. The supposition seems to be that if the architects were freed of the Planning Department’s constraints, great, iconic architecture would spontaneously appear. Sorry, don’t buy it. Market-constrained design is inherently conservative. Once the developers discern the minimum acceptable standards, they set the ceiling, not the floor. I well remember an informal meeting I had in James Cheng’s office with one of the City’ Hall development-permit architects. They were responding to a concern I had, after seeing the model for Quayside – the Concord Pacific complex that now lines Marinaside Crescent, between Davie Street and the Cambie Bridge – that it was all too much the same. How about at least a little variation in colour? Both of them assured me that, though it was subtle, it would fit well into the larger palate that was planned for the megaproject. I didn’t get any sense that the City was forcing a reluctant developer into a straight-jacket. As a Councillor, there really wasn’t much I could do other than express my concern. Other Councillors didn’t like getting involved in design decisions – the job, they felt, of the professionals. And indeed, the development process in Vancouver keeps politicians out of the approval process once Council decisions have been made on zoning and general policy. It’s one of the reasons the quality of urban design is high: no deals are done to dumb-down projects; negotiations are done at the staff level, insulated from the politics. Yes, there’s a need for more ‘iconic’ foreground buildings in Vancouver. But too often the suggestion is made that by negating, amending or ignoring some general policy – like height limits or view-corridor requirements – we would get brilliant architecture as a result. I just don’t think the record, the experience of other cities or common sense gives a guarantee of that.